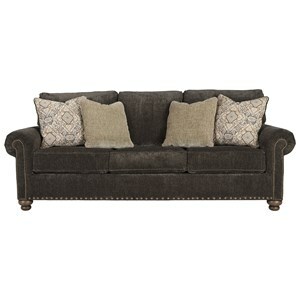 Luxurious comfort and appealing contemporary style make this queen sleeper sofa a must-have for a chic living room that doubles as a place to accommodate guests. As a sleeper it features an easy to lift mechanism for pulling out the queen-size memory foam mattress. Every day you can settle in and relax in the comfort of the coil spring seat cushions in a boxed, T-style shape designed for a durable uniform shape with consistent support. The sofa's four scatterback cushions provide a cottage look with two charcoal fabric pillows and two additional pillows with a floral design on one side and charcoal fabric on the reverse. Two stripe accent pillows and two abstract script pillows each feature feather blend pillow inserts accessible via a hidden zipper. The combination of fabrics inspires with a sophisticated cottage style. 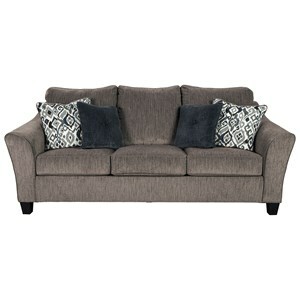 Completing the sofa's look are flared arms and tapered wood legs in a dark finish. 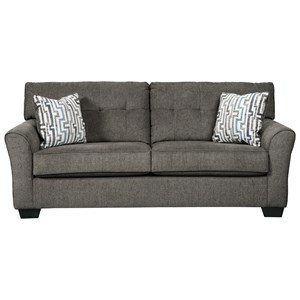 The Levon - Charcoal Queen Sofa Sleeper with Memory Foam Mattress by Signature Design by Ashley at Casa Leaders Inc. in the Wilmington, Long Beach, Torrance, Lakewood, Los Angeles area. Product availability may vary. Contact us for the most current availability on this product. Fabric Content Levon Charcoal Fabric: 100% polyester. Beatty stripe fabric: 100% cotton. Floral fabric: 61% rayon, 39% polyester. Caligraphy abstract print fabric: 100% cotton. Pillow 4 Square Accent Pillow with Feather Blend Inserts and Hidden Zippers. 2 Accent Pillows have Stripe Fabric on One Side/Charcoal Fabric on One Side. 2 Accent Pillows have Script Fabric on One Side/Charcoal Fabric on One Side. Tailoring Stripes and patterns are match cut. All fabrics are pre-approved for wearability and durability against AHMA standards. Seat Back 4 Loose Scatterback Pillows. Charcoal Fabric on Both Sides of 2 Pillows. Floral Fabric on One Side/Charcoal Fabric on One Side of 2 Pillows. Seat 3 Loose Seat Cushions. Boxed, T-Style. 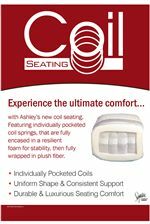 Cushions Feature Individually pocketed coil springs that are fully encased in a resilient foam for stability then fully wrapped in plush fiber. The coil seating offers a uniform shape with consistent support plus durable and luxurious seating comfort. 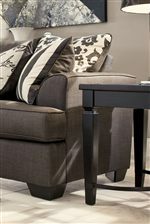 The Levon - Charcoal upholstery collection pairs contemporary style with a perfect combination of cozy cushions in sophisticated fabrics. The sofa is effortlessly inviting with scatterback pillows in the Charcoal gray and floral motifs plus feather blend accent pillows in a stripe fabric and abstract script fabric. 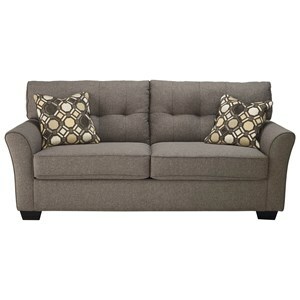 The patterns create a cottage style look that complements the soft crosshatch Charcoal gray primary fabric. 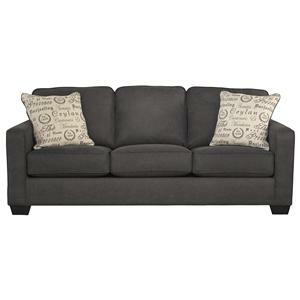 Boxed T-cushions with welt trim, tapered feet, and flared arms complete the sleek design. 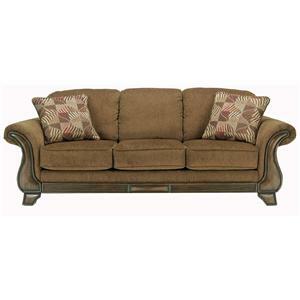 The sofa and loveseat cushions are constructed with pocket coil springs encased in foam for luxurious comfort, uniform shape, and consistent support. An armless showood accent chair in the abstract script fabric and accent chair in a pretty floral fabric are all you need for an appealing new decor in your living room. 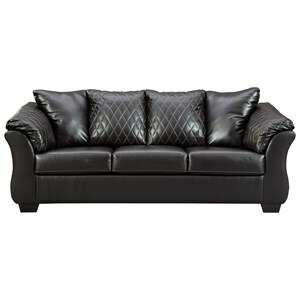 The Levon - Charcoal collection is a great option if you are looking for Contemporary furniture in the Wilmington, Long Beach, Torrance, Lakewood, Los Angeles area. 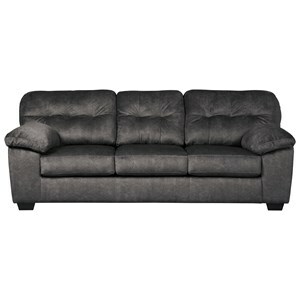 Browse other items in the Levon - Charcoal collection from Casa Leaders Inc. in the Wilmington, Long Beach, Torrance, Lakewood, Los Angeles area.